Former President Mahmoud Ahmadinejad has assailed Iran’s regime, declaring that there was more freedom under the monarchy of the Shahs. Intriguingly, the criticism came in an interview with Fars, a site linked to the Revolutionary Guards. 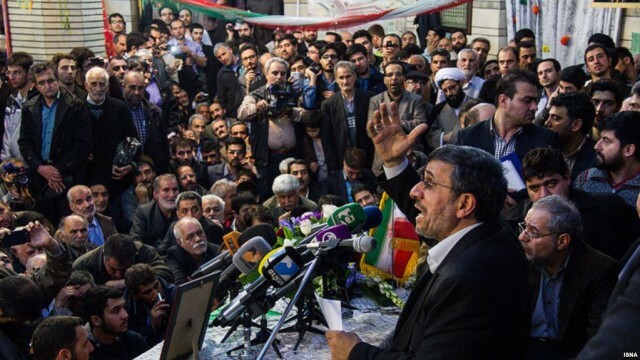 It was the first time that a State or semi-official platform gave space to Ahmadinejad since he left office in August 2013. Fars said the interview was conducted a few weeks ago, but only published an account on Monday. Although the ruling establishment reacts less harshly against its dissidents, it has expanded the sphere of its confrontation with the people. I mean, comparing with the past, the situation with freedom is much worse today. Ahmadinejad has maintained a tense relationship with the regime since 2013. He was allowed to remain as a member of the Expediency Council, even as he assailed Iranian officials as corrupt and said they hindered the freedom of Iranians. However, he and his closest allies were blocked from running for the Presidency in 2017. Several of his high-ranking officials, including Vice President Mohammad Reza Rahimi and Hamid Baghaei, have been given lengthy sentences for corruption and fraud. Regarding nepotism, we are now dealing with a family reign. Under the Shah, the economy and private sector had more freedom. After the Revolution, this was tightened under the pretext of fighting capitalism. People’s businesses were confiscated and placed at the disposal of government organs and organizations. In addition to his attempt to regain political position inside Iran, Ahmadinejad has maintained a line outside the country with his use of Twitter, despite the platform being blocked inside the country.